DISCLAIMER: Normally, you read “what’s out there” before posting an opinion, in the interest of being more informed (or appearing so). This is an entirely personal reflection with only the sparsest research. 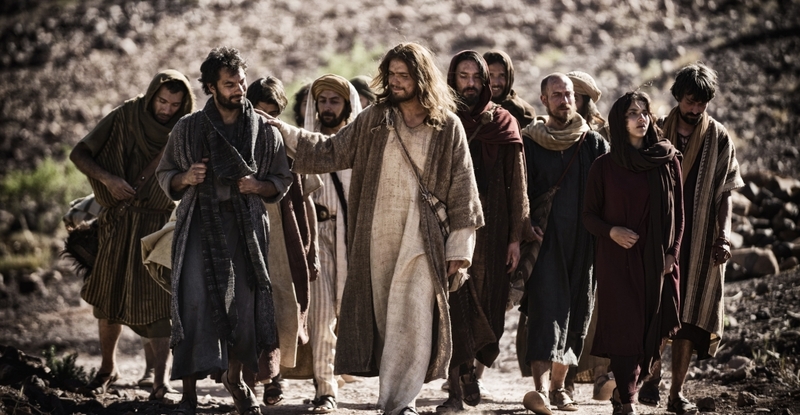 Watching The Bible, Episode 4: Mission last night with my sons engendered discussion much as the other three episodes have: “Dad, did Jesus pass out in the desert?. . .Was Pilate really mean?. . .Do you think Jesus was that calm when he cleansed the temple?” Of course, I don’t have informed answers to all their reading-between-the-lines questions. Nobody does. As with previous episodes, I found Mission delightfully insightful, provocative and, at points, pretty loose on the Bible’s particular narrative details. That brings me to the question of the portrayal of Jesus, a formidable challenge for any actor, I’d think. Hollywood Jesuses come off as either spacey and aloof (he is divine, after all) or down-home comfy in their everybody-rides humanity. Diogo Morgado does an admirable job as Jesus in this miniseries, though he tends towards the latter extreme. I guess every actor has to answer the question for himself that Morgado’s Jesus asked his disciples, echoing Matthew 16: “Who do you say that I am?” (In the biblical account there were a few guesses before Peter “surprised” Jesus with the right answer.) Getting the answer right is the key not only to the persona of Jesus, but to the character of the most important person in the history of the world. The Jesus of Scripture barely fit the values and status of his own culture, much less ours. He healed the sick with genuine compassion, yet his rebukes of the Pharisees were as comfortless as Old Testament prophets’ devastating judgements. He was clearly the friend of sinners, but he cleansed sin out of the temple more than once, as if he owned the place. The biblical Jesus is full of such paradox. And rightly so. Because the Jesus of Scripture is both human and divine, fully so, simultaneously. Two natures; one person. No confusing the two. He who wept over his friend Lazarus (another omission in Mission) took absolute authority over death and brought a stinking-dead human being back, to live out the rest of his natural life. Death didn’t even have a chance, because the Author of life, the human-making, soul-breather-into-dust God of eternity was standing outside the tomb, effortlessly flicking death away like a pesky gnat. Who-the-freak is this guy? The Jesus of Scripture is God the Son, pre-existing in eternal community with the Father and the Spirit, one God in three persons. Before the world was, He is. When he uttered those words to the officials who came to arrest him, John 18 says, “they drew back and fell to the ground.” Were he not fully God and fully man, Jesus could not have taken the penalty for the debt we owed and paid for it eternally by laying down his human life. His role as our substitute, the lamb of God sacrificed for you and me for all-time, motivated God himself to provide by taking on human flesh and suffer so we could be saved by his one act of righteousness, undoing the one act that plunged the whole race into guilt and sin. How do you portray that multi-dimensionality in a two-dimensional world of movies or television? You try to come close, and you leave it to aware or curious viewers to make up for deficiencies. That is exactly what Mission’s Jesus did, with admirable results. Some (I’ve heard) have worried about the implicit Christology of The Bible miniseries. I can understand why. The question, “Who do you say that I am” is the most important of all. But I don’t fault the imperfect portrayal of the perfect God-man for our failing to get the right answer. The purpose of The Bible, Mark Burnett and Roma Downey told us, is to raise questions that will drive viewers to the real Bible. So, who do you say he is? To benefit from the sacrifice he made objectively, historically, one must invest a personal, subjective faith. I do think the miniseries does a good job of emphasizing trust in God as a major theme (though at times it appears nationalism or religious lawkeeping substituted for faith, which neither ever did.) Eternal salvation is offered as a free gift to whoever will believe, trust, subjectively receive the objective Jesus as the way, truth, life and only way to restoring a favorable relationship with God, His father and ours. When he is Lord, not only objectively (which he is) but of your life, you become connected with the eternal, triune God, eternally. That change in eternal life is the consequence of getting the “Who am I” question right. Granting a charitable verdict to The Bible’s Jesus, we will all be judged by what we do with the Scriptural, historical Jesus. Martha’s confession outside the tomb of Lazarus gives us the only correct answer: “I believe that you are the Christ, the Son of God.” It was enough to superintend the miracle of resurrection that day. And it is still the efficient cause of resurrection for everyone who utters it in genuine faith today. REIGNS over heaven and earth, establishing his kingdom both now and in the consummate future. This Jesus, now resurrected, reigning and returning to finally redeem and judge the world, is the Christ of Christmas. Please don’t separate the person of Christ from the work of Christ, either in your thinking or your worship. The point of the incarnation is death and resurrection, and the point of resurrection is redemption for a lost and sinful world, for all who follow him as Lord by faith. Hebrews 7:26 – He is the kind of high priest we need because he is holy and blameless, unstained by sin. John 10:18 – No one can take my life from me. I sacrifice it voluntarily. Romans 5:6 – When we were utterly helpless, Christ came at just the right time and died for us sinners. 2 Corinthians 5:21 – For God made Christ, who never sinned, to be the offering for our sin, so that we could be made right with God through Christ. 1 Corinthians 15:45 – The Scriptures tell us, “The first man, Adam, became a living person.” But the last Adam—that is, Christ—is a life-giving Spirit.